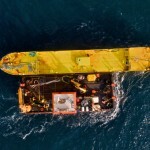 Spanish tidal energy developer, Magallanes Renovables, has generated its first electricity into the UK national grid following connection at the European Marine Energy Centre (EMEC). 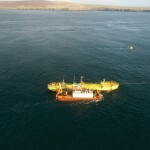 The ATIR tidal energy converter (TEC) was installed at EMEC’s Fall of Warness tidal energy test site in Orkney, Scotland last month by Orkney-based Leask Marine, as part of the Ocean_2G project. The project is funded by the Fast Track to Innovation pilot scheme, part of the EU’s Horizon 2020 research and innovation programme. Since installation, the team have worked hard to prepare the ATIR for grid connection. 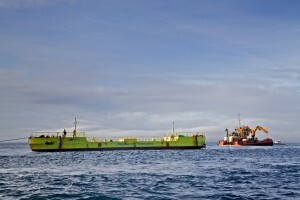 The ATIR was successfully connected to the grid via EMEC’s subsea cables and onshore substation on 2nd March 2019, and generated its first power a short time after. The first generation of power is a major milestone within the Ocean_2G project, which aims to test, validate and pre-certify Magallanes’ device. The device will now undergo a structured programme of testing, which will demonstrate the operational performance of the ATIR, in preparation for readying it to market. Led by SAGRES – Magallanes Renovables’ parent company – the Ocean_2G project consortium brings together EMEC, Leask Marine, and electrical specialists IM FutuRe. 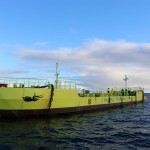 “The marine energy industry has taken momentous steps forward in recent years and it’s great to see this project add to a number of recent success stories where Scotland has been at the forefront of global research and development and tests and demonstrations. “This is a tremendous achievement for Magallanes and Ocean_2G partners, and we look forward to witnessing the pioneering 2 MW ATIR prototype in action, as it takes the tidal sector another leap forward towards commercialisation”.